POSERS AND WANNA-BES, STEP OFF. IF A CAR LOOKS fast, it should drive fast and had better pack the punch to back up its aggressive looks. Mike Rubino, self-proclaimed all-wheel-drive turbocharged platform fanatic, sold his WRX to pay for school. The only condition he imposed on himself was to replace the car with something better upon graduation. With diploma in hand, Rubino searched for a viable Subaru replacement but couldn’t see himself being cool behind the wheel of a wagon, even if it wore the STI nameplate. It simply didn’t look the part. Without a fifth door in sight, Rubino decided a Phantom Black EVO projected the right image. He now held the reigns of what would soon become an all-wheel-drive monster. 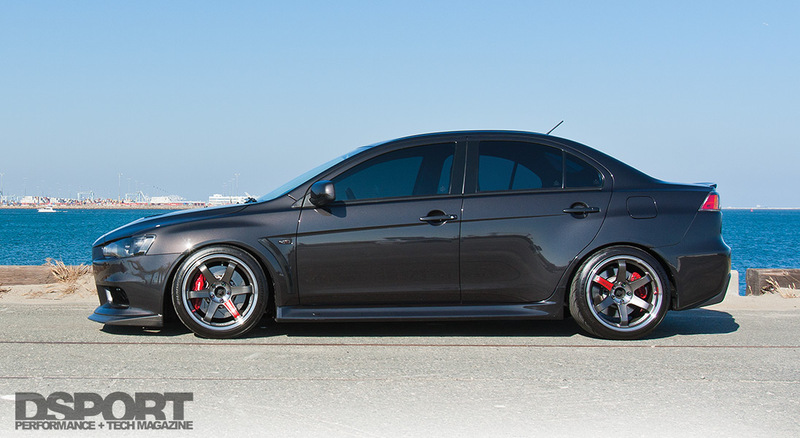 The EVO X delivered everything Rubino wanted and more. He planned to drive the car in stock form before implementing any of the changes he’d dreamt about in school. After only 800 miles on the odometer, it was clear that Rubino wasn’t sticking to plans. Long before the first scheduled oil change, several bolt-on upgrades and a reflashed ECU teamed to deliver over 400 horsepower on 91- octane pump gas. It was good, but Rubino craved more. At the threshold of stock 4B11T reliability, Rubino decided to upgrade the short-block in order to reach 600 horsepower. 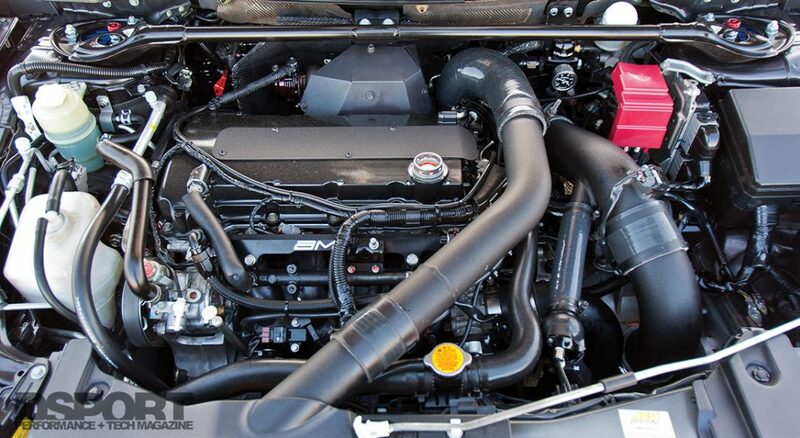 To avoid being another 4B11T statistic on the forums, Rubino delivered his EVO X to Cobb SoCal for the engine build. Improvements began with a 0.5mm overbore and hone of the cylinders. The prepped block then received a complete Manley stroker-rotating assembly consisting of Platinum Series pistons, Turbo Tuff I-beam connecting rods and a Manley stroker billet-steel crankshaft. Cobb SoCal selected ARP main studs to secure the crankshaft. The Manley stroker system increased the engine’s displacement to 2,210cc. The cylinder head also received attention to complement the 11-percent displacement increase. After a port and polish service, Supertech +1mm valves and Kelford valve springs filled the head. To actuate the valves, a set of higher lift and longer duration Kelford 214-B camshafts replaced the stock bumpsticks. Cobb SoCal torqued the ARP L19 head studs to its elevated torque spec. The additional clamping force delivered by the ARP L19 studs insures that the Cosworth head gasket maintains a positive seal. The existing aftermarket turbocharger no longer matched the engine’s new displacement configuration. As such, Rubino exchanged that turbo and its supporting components for an AMS 750R turbo kit. 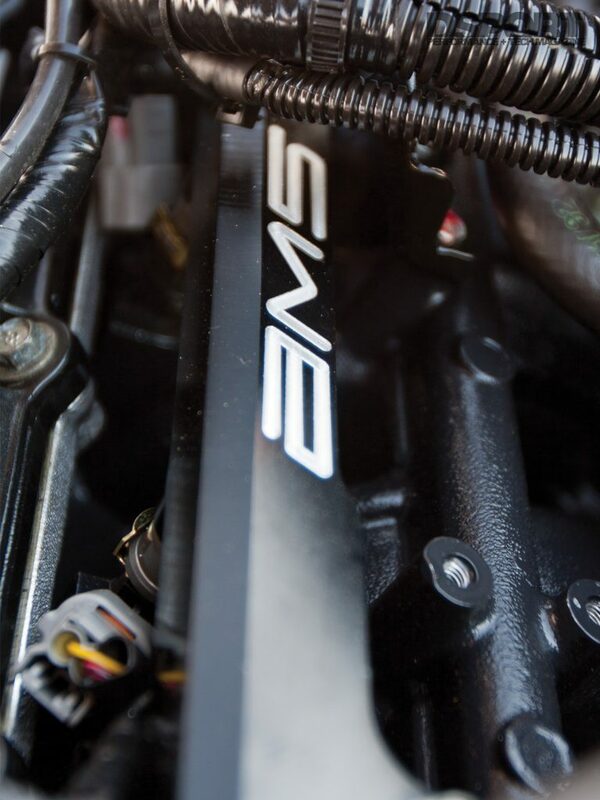 The AMS cast manifold positions a higherflowing Precision Turbo and Engine PTE5857 turbocharger. Spent gasses exiting the turbine flow through a custom B-Line Motorsports exhaust. 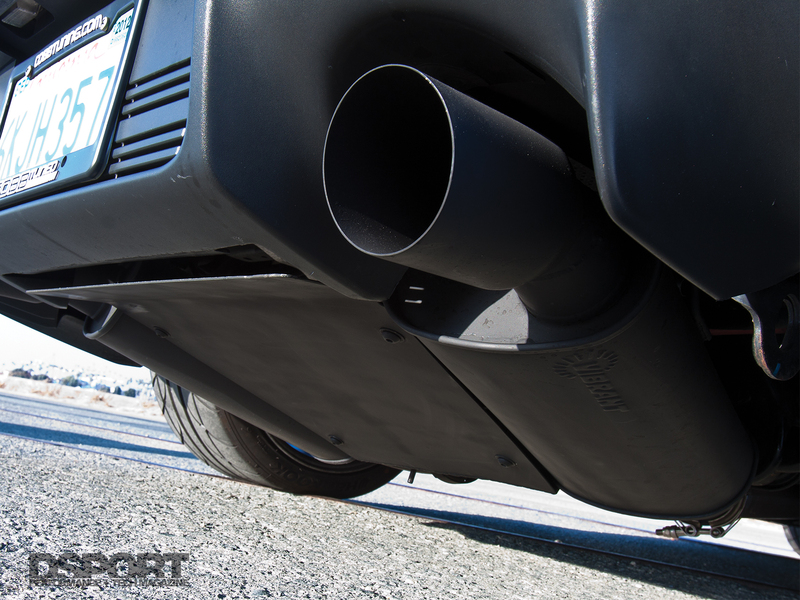 The turbo-back exhaust features V-band connections and directs gasses through a pair of Vibrant Performance mufflers. B-Line also fabricated intercooler piping that joins the compressor outlet to the AMS 3.5-inch front-mount intercooler for heat exchange. 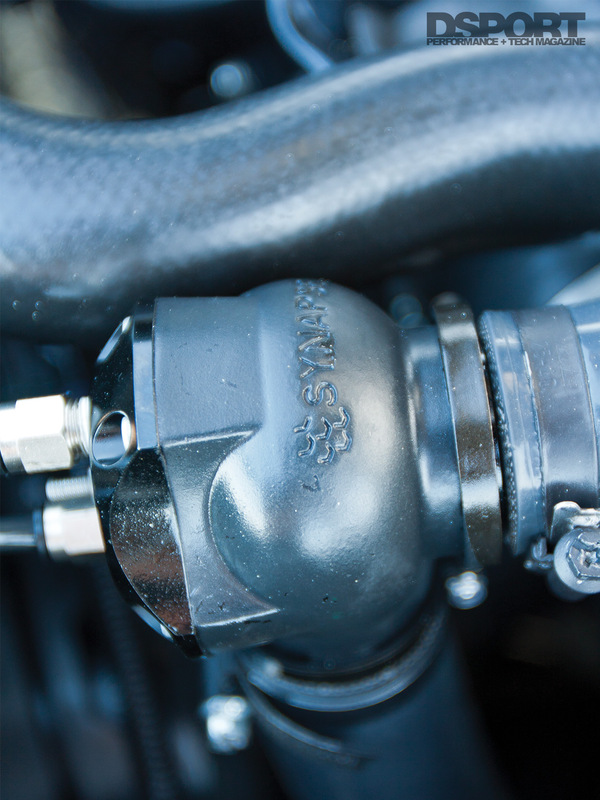 Once the cooled charge-air reaches the intake manifold, a quartet of Injector Dynamics ID2000 injectors spray E85 into the combustion chambers. 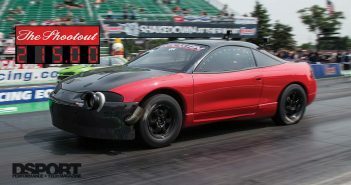 With tuner John Drenas utilizing open-source tuning software to recalibrate the ECU, the stroker engine put down 650 horsepower and 481 lb-ft torque to the rollers of a Mustang Dynamometer (@30 psi of boost pressure). A stock EVO X on this same dyno delivers only 264 horsepower. 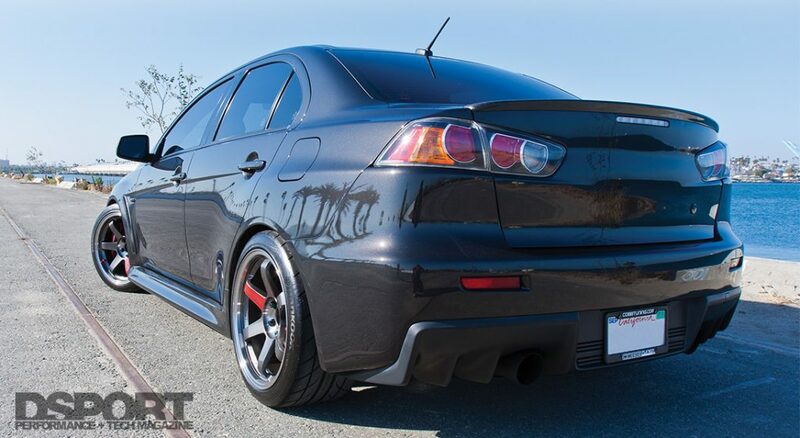 Hence, this EVO X is delivering 2.5 times the power of a stocker. 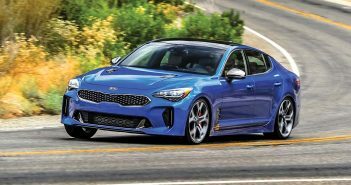 With almost three-times the factory horsepower output by the new engine, the factory driveline components were destined for failure. Rubino selected an MA Performance lightened flywheel and a S.P.E.C. Clutch Stage 3+ clutch to modulate the power delivery. 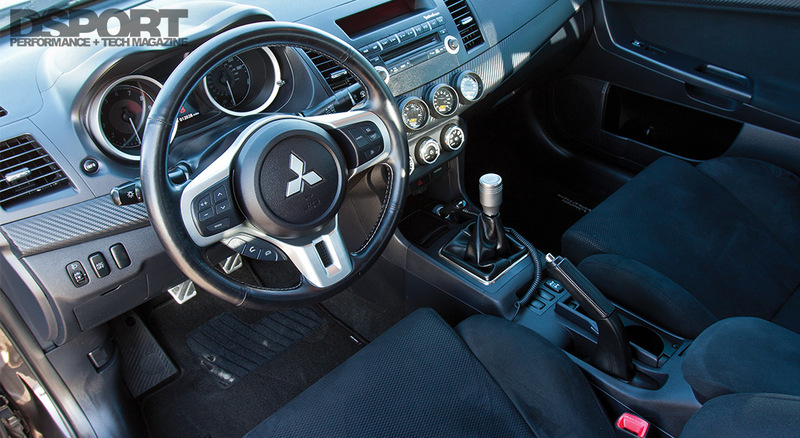 Because the EVO X transmission gears and center differential are also commonly subject to failure, Rubino sent the transmission to Jack’s Transmission in Colorado Springs, Colorado for reinforcement. The specialists at Jack’s Transmission tore down the box and made the necessary upgrades to the gears and center differential. These upgrades prepared the driveline for the increased torque capacity. The newfound power and driveline components necessitated an increase in chassis and suspension performance. Rubino installed JRZ RS1 adjustable dampers and Eibach springs to introduce a level of fine-tuning for the suspension. This refined suspension can now be tuned for track surface conditions. 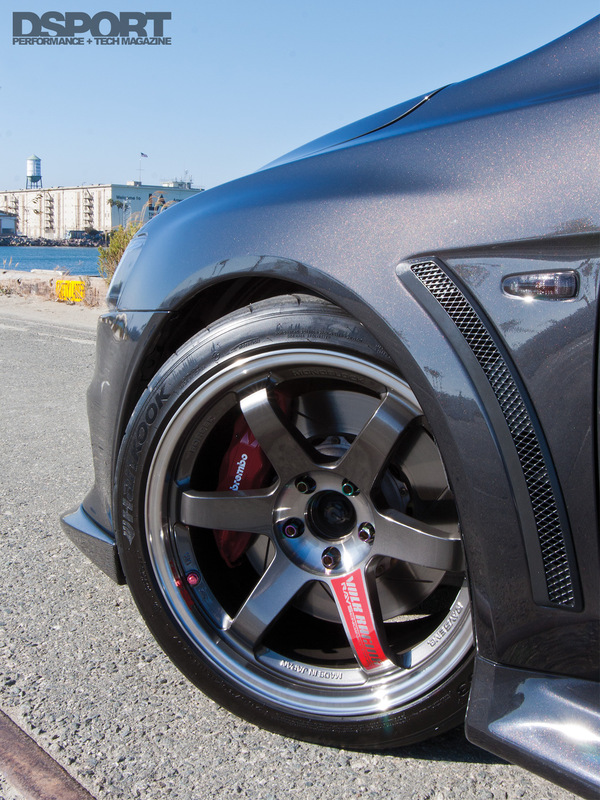 To shed speed when needed, the EVO X’s Brembo calipers squeeze Ferodo pads against Girodisc rotors. Volk Racing TE-37SL wheels wrapped in Hankook R-S3 tires provide an effective contact patch. Although the build took longer than originally expected, Rubino thoroughly enjoys the build outcome. He commented, “We decided to wait for parts rather than settling for whatever was readily available. Everything came together nicely in the end and I am proud of the hard work that everyone put into the car. Although I’ve never dragged the car, I plan to hit the strip to see what it can do. 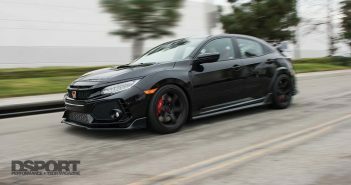 In the meantime, the car will see regular track time at Big Willow and the Roval at Auto Club Speedway.” While selling your car to pay for college may be unthinkable, being able to build a 650whp graduation gift is the American dream.